Visit to GEO600 in Ruthe. By Kris Schroven, PhD candidate RTG "Models of Gravity"
Located in the countryside in Ruthe, close to Hanover, is the gravitational wave detector GEO600. On one of the first spring like days this year we (the RTG fellows) had the chance to pay a visit. Here is what we saw and learned from it. Supernovae or coalescing massive binaries, may it be neutron stars or black holes, are astronomical mega events, which create such strong gravitational waves, that they are still measurable on earth as extremely small, periodic distorions in spacetime. Exactly for this purpose GEO600 was built. Gravitational waves were predicted by Albert Einstein 1916 as solutions to his field equations. It was only last year, almost 100 years later, that these distortions were directly detected for the very first time by two LIGO gravitational wave detectors located in the USA. This fact made it particularly exciting for our group of PhD candidates to visit such a detector in Germany which is a Michelson interferometer with 600 m long arms. Although being a much smaller colleague than his American relatives, who sport arms with 4 kilometers lengths, the GEO600 has made up for this disadvantage with a more sophisticated technology, e.g. its laser system and mirror suspension. However, it should be noted here that eventually, both developments have been playing a leading role in last year's findings of the gravitational waves. The reason for this is that while reconstructing the LIGO detectors in the USA, by this becoming the Advanced LIGO, the GEO600 developments have been implemented. From the exterior GEO600 looks rather low-key as we drove on a small road along one of the interferometer arms and a small tree nursery for apple trees to the main part of the facility. The interferometer arm was at first not recognized by us as what it was, since it looked more like some kind of cable channel of pipeline. At heart of the facility are just three container huts, which contain the control room, the workplaces for the scientists on site and the central building of GEO600. But during our two hours visitors' tour we were able to look behind the unobtrusive outside walls of GEO600 and gained interesting insights into the construction and function of the wave detector. While talking and waiting in the sun for our taxis back to Sarstedt station some more nice little facts about GEO600 were revealed, e.g. : Every earthquake on earth with a magnitude of seven or higher shuts down the detector for hours. At around 6 pm our excursion led us back to Hanover main station where we spent the night in order to attend our RTG colloquium at the University of Hanover the following morning. We enjoyed our visit the GEO600 and their friendly staff a lot and would like to thank them - especially Benjamin Knispel - to make this trip possible for us. 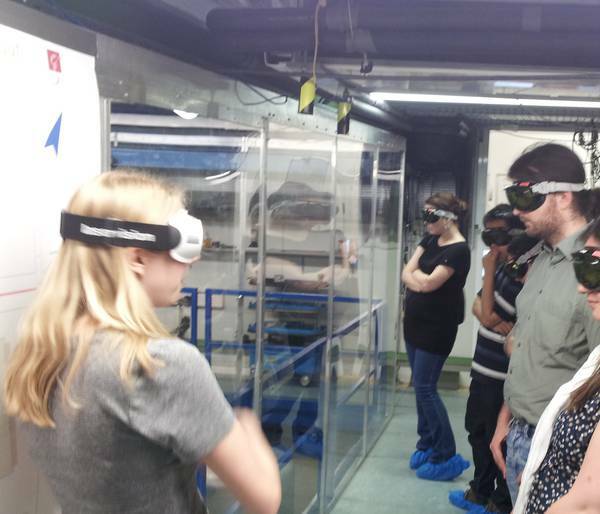 During our Networking Workshop, a joint meeting of our RTG and the RTG 1523 "Quantum and gravitational fields" from Jena, a field trip was organized to visit a nearby site of Airbus DS (Defence and Space). Airbus DS is a subdivision of the Airbus group concerned with the development of air and space flight technology for military and civil purposes, with their headquarters in Munich. The site in Bremen is specialized on the areas of manned spaceflight, launch vehicles and space robotics, and has contributed to important international projects such as the International Space Station ISS and its Columbus module and the development of the unmanned Automated Transfer Vehicle (ATV). Currently the site is involved in the production of the Ariane 5 rocket. Our group of researchers was welcomed by Bart Reijnen, the site director of Airbus DS Bremen, with some information on the company's activities. To complement the technical aspects, the head of human resources was present as well and answered questions about job opportunities for young physicists at Airbus DS. Following the general introduction and a Q&A-session, we were given guided tours around the site and the development facilities, where we could take a look at the ongoing production of the upper stage of the Ariane 5 launch vehicle currently developed by Airbus DS, and were allowed to see live broadcast from the ISS and inspect a lifelike replica of an ISS module. RTG fellows visited the gravitational wave detector GEO600 near Hannover on June 5th, 2013. 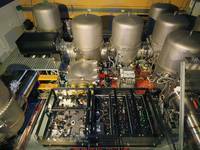 GEO600 is a project, which aims to detect gravitational waves by means of a laser interferometer of 600 m armlength. Gravitational waves were originally predicted by Albert Einstein in 1916 but were not yet directly observed. They consist of extremely small ripples in the structure of spacetime which are caused by astrophysical events like supernovae or coalescing massive binaries like neutron stars or black holes. GEO600 ist the only functional gravitational wave detector at the moment due to the fact, that the other setups are under reconstruction. The RTG researchers, who are theoretical physicists and mathematicians, gained insight into the construction and function of the wave detector. Furthermore, information was obtained about the hurdles in observation of gravitational waves as background signals of different origin, rare probability of the occurrence of supernovae within the exprected detection range and the sparse size of expected signals. 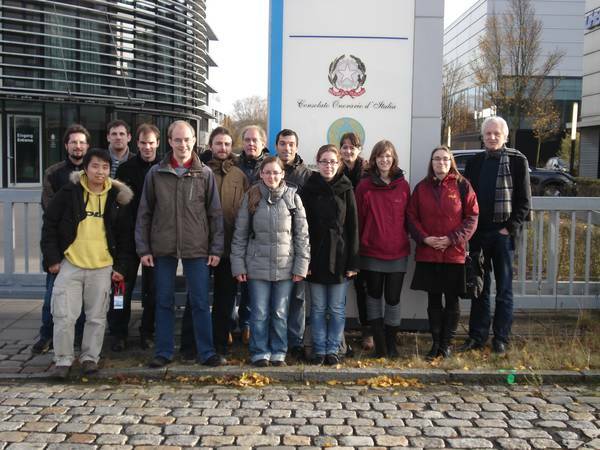 Members of the RTG “Models of Gravity” visited the space company OHB System AG at the Technologiepark Bremen. OHB System AG develops low-orbiting and geostationary small satellites for navigation, communications, scientific research and earth observation. Its manned space flight activities include the participation in the assembly and outfitting of the International Space Station ISS, the Columbus research laboratory and the ATV automatic transfer vehicle. The PhD students and Postdocs got information about OHB projects and learned about job perspectives and careers at OHB. A look into the laboratories where satellite parts a build together rounded up the visit.